I ran into a retired guy a few days ago who, as part of a more extensive conversation, told me that he “did nothing all day”. Watched some TV, did a bit of shopping, and lazed around. He appeared to be quite proud of that. It would seem that for a few retired folks that is the ultimate reward, but I’m glad to report that it’s certainly not the norm in Haliburton County. It’s not that I begrudge him the reward he feels he has attained. It’s more about worrying for his early decline. The majority of retired persons I know have multi-faceted life portfolios – a mixture of volunteering, exercise, participating and even working part-time. They are interesting, vibrant and contributing individuals. And they appear to last a long time as a result. 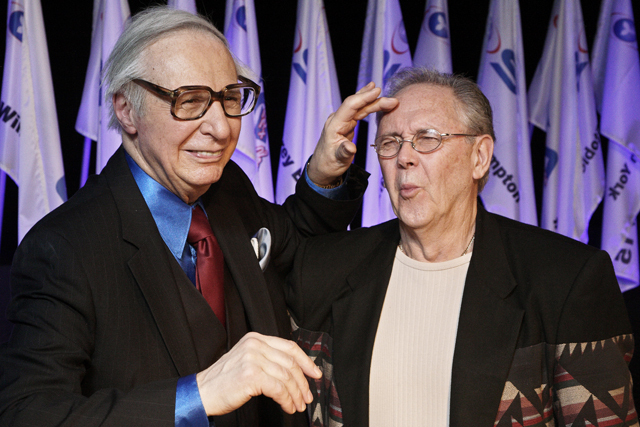 Here I am having my "head read" by Kreskin. At 76 years of age, The Amazing Kreskin does about 300 shows a year. His support staff report that his pace leaves them breathless. I anticipate that in the next state of non-being, from the nether world, I’ll still be actively trying to meddle in my family’s lives. I wonder if they have part-time work up there (or maybe it will be down there?) You know what they say about idle hands! Next Next post: Darned Kids!